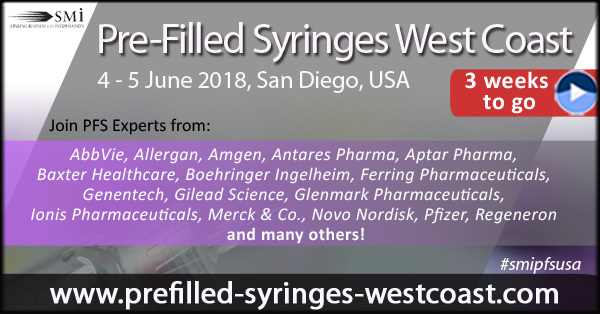 In just 3 weeks, SMi Group will open its doors to host the next instalment in this year’s PFS conference series, 3rd annual Pre-Filled Syringes West Coast (June 4 – 5, San Diego). Following in the steps of the European and Boston events, the San Diego PFS show will once again gather a truly global audience from not only the USA, but also Belgium, Denmark, France, Germany, UK, Japan and more. As well as providing guidance on regulatory expectations and assessing quality control systems and risk-based control strategies, the agenda for 2018 will also feature a spotlight on human factor engineering, manufacturing in the landscape of complex biologics, and showcase emerging trends of technologies and studies to assist device and drug formulation developers.